Echolalia is a fancy word for the repetition of spoken words. For typical toddlers, it’s a transition period in language development. For autistic people who don’t have functional language skills, it’s a means of communication. For me, it feels like a kind of ‘found speech’, similar to the cast-off pieces of pipe and rusted metal that an artist might use to make a sculpture. There are two types of echolalia: immediate and delayed. Immediate echolalia is the echoing of words that someone has just said. It could be an entire sentence, a phrase or a word. I heard a good example of this at the zoo last weekend. A man beside me said to the young child with him, “are those zebras real or in a book?” The child immediately replied “in a book” even though two very large zebras were walking toward him. In this instance, it was obvious that the boy was repeating the last few words spoken. But what if the man had asked him, “do you want to see more animals or go home?” If automatically he said “go home” because it was at the end of the sentence he might be really upset when he found himself getting bundled into the car before he’d seen the monkeys and the tigers. Immediate echolalia can cause miscommunication–which may lead to meltdowns–if adults aren’t careful with how they word questions. Delayed echolalia is the repetition of speech after time has passed. Sometimes it takes the form of lines from TV shows, movies, video games or books. Other times it may be words that were spoken by family members, friends, teachers or caregivers. Everyone, even typical adults, engages in delayed echolalia occasionally. Lines from movies and TV shows enter the cultural lexicon and become shorthand ways of communicating. For example, if you know the origin of “that’s what she said” your reaction to the title of this piece will be different than the reaction of a reader who isn’t familiar with the context that phrase is often used in. 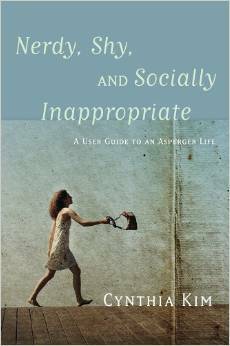 Autistic people often develop their own collection of stock phrases–called neologisms. These have specific meaning for the speaker but may not mean much to anyone else. For example, a child might use a phrase like “TV is broken today” to express upset. Why? Because one day when he wanted to watch his favorite video, his mom told him the “TV is broken today” and that phrase became associated with feelings of upset for him. When he comes home after a bad day at school and says, “TV is broken today” he’s letting his mom know that he’s upset. Neologisms can be hard for listeners to understand, especially if the original context for the found speech is unknown. If you didn’t know my Disney Baby story and I said “it’s a bright sunny day” to you, you would probably find it an odd or somewhat meaningless statement. But when I say it to The Scientist, he immediately understands what I’m referencing. To better understand how echolalia serves as a communication tool for people without functional language, it’s helpful to think about how we learn a second language. Before learning grammar, we memorize common phrases. Those were some of the first things I learned in French 1 (Sylvie was my “French name”). I remember repeating those phrases over and over many times before I had any idea which word meant good or name or how. As I learned more vocabulary and grammar, the lessons moved from unmitigated echolalia (the exact repetition of phrases) to mitigated echolalia, which is the substitution of single words within a phrase. In addition to ça va bien, I learned ça va mal and so on, gradually expanding from relying on echolalic interactions to forming sentences based on grammar rules. Now imagine if my French teacher hadn’t explained how to put the phrases together into a conversation. What if she’d said, “Comment ça va?” and nothing more? If I wanted to engage her in conversation, I might have simply repeated back “comment ça va?” Echolalia, at it’s most basic, is a way of indicating interest in conversing. It’s saying, I want to engage with you but I don’t understand the words you’re using so I’ll show my interest by repeating them. Imagine I said to you “blerg ick gump?” and then gave you a delicious treat. A few hours, later you decide you want another one of those yummy things so you walk over to the spot in the kitchen where you know the yummy thing comes from and say “blerg ick gump?” You have no idea what the words mean–and you certainly don’t know that you’re supposed to transform my “blerg ick gump?” into the correctly worded “norkle ick gump?” All you know for sure is that the last time I said “blerg ick gump?” a treat materialized, so what the heck, maybe it will work again. If a child doesn’t yet understand that the interrogative “do you want a cookie?” is different from the declarative “I want a cookie” (or the correctly worded but completely different “may I have a cookie?”) they may use echolalia as a linguistic shortcut, repeating the phrase that always precedes the cookie to request one. The phrase itself has only symbolic meaning–it’s associated with the delivery of a cookie, which the child is trying induce. When you think about it, the way we teach language to very young children is quite sophisticated. My French 1 teacher wouldn’t have expected me to guess at the answers to her questions, to simply know that the answer to comment ça va? is ça va bien. Typical children absorb a great deal of language pragmatics by example. Autistic children, however, may need more explicit modeling. Instead of holding up a cookie and asking “do you want a cookie?” the parent of an autistic child who is echolalic could model the proper requesting language by saying “I want a cookie”, taking a cookie for herself and handing one to her child. With repetition and a bit of luck, the child will learn to say “I want a cookie” to make the request. Like all forms of communication, echolalia has a diverse set of purposes. 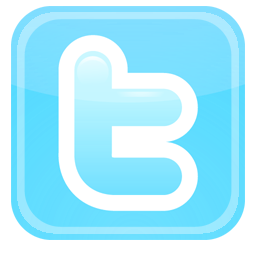 Generally, it can be divided into interactive and noninteractive. Interactive echolalia imitates the structure of interactions, even if the chosen words or grammatical forms are inappropriate. So a child can practice turn taking, an important conversational skill, by echoing what an adult says rather than producing unique speech of her own. Or she can request an activity by using a related echolalic phrase, such as saying “get your coat” as a way of requesting a visit to the park. Even in people with more developed speech, echolalia can be used to buy time for a response or to assist with speech processing. I frequently repeat unexpected questions out loud–in a tone of voice that indicates that I’m querying myself–as a type of mitigated echolalia. This strategy pauses the conversation and indicates that I’m formulating a reply. Barista: Do you want whipped cream on your latte? Me: Do I want whipped cream on my latte? People seem to find this oddly charming and slightly less weird than a long awkward pause during which I stare at the ceiling. Non-interactive echolalia is the use of words for self-regulation, self-direction, rehearsal or stimming. While echolalia naturally decreases as a person acquires functional language, many autistic people engage in non-interactive echolalia alongside their developed receptive and expressive language. 1. Self-regulation and self-direction: Repeating a word or phrase can be a way of mentally staying on track. For example, your boss says, “it’s important that you reformat the spreadsheet and email it to me as soon as you get back to your desk” and all the way back to your desk you repeat “reformat the spreadsheet and email it” so that you don’t accidentally wander off and decide to make copies of a report you’ve been meaning to distribute to your team instead. In more acute situations, echolalia helps with calming or self-regulating. Sometimes when you’re panicking, if someone says “it’s okay” you might yourself automatically repeating their words in a reassuring voice to yourself. Often The Scientist will say something soothing when I’m spiraling into a whirlwind of upset. Repeating his words helps me to break the cycle of unhelpful thoughts in my head by shifting my focus to his more neutral or calming words. There is a tendency for autistic people at all developmental levels of speech to become more echolalic under stress, which points to a strong self-regulation component to echolalic speech in general. 2. Rehearsal: Have you ever asked someone what to say in a situation and then used their words verbatim? In the meantime, I bet you practiced how you were going to say it, repeating the script until you had it memorized. Echolalia can serve as rehearsal for a complicated or anxiety-inducing verbal interaction. In fact, it could be argued that social scripts of any sort are echolalia, especially those we’ve picked up after hearing others use them. 3. 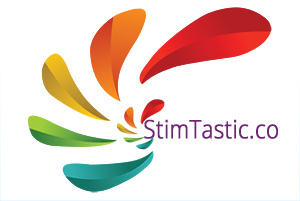 Stimming: This is the form of echolalia that I engage in most. Someone will say something and I’ll repeat it because I like the way it sounds or the words are fun to play with. I’ll sing it or stretch it out or transform the words by changing syllables. Technically this is referred to as “unfocused” echolalia, but I think viewing it as stimming is more accurate. It’s a form of wordplay, but it’s also definitely a stim: I do it more when I’m stressed and it has a calming effect. It was completely meaningless and very very entertaining. By the time I was done cooking, I felt much better. There’s a final form of echolalia that gets discussed less often. In addition to being the repetition of exact language fragments, echolalia can take the form of imitating a person’s tone of voice, pitch, rhythm of speech, volume and/or inflection. This is why a lot of autistic adults find themselves in the embarrassing situation of accidentally starting to speak like a person they’re spending a lot of time with. If someone ever asks me that again, I think I’ll tell them I’m from Echolalia. I smiled when I saw the opening lines of your post! I definitely know what you mean about what is meant is what is said, but not necessarily what is heard/interpreted by the listener. Your recipe example made me smile but also reminded me of my habit of repeating parts of my shopping list while I’m searching the shelves. I think in my case it’s to compensate for poor short-term memory. When I shop, I often catch myself reading the aisle signs out loud. This sometimes results in people trying to help me “find” stuff by pointing out that I’m standing right in front of the soda aisle or the cereal aisle. Which, yeah, I know. I’ve never had anybody try to help me like that, but I have seen a few keep back from the “crazy person who’s talking to himself”! Yes, I might be talking to myself but I can still hear you. Respond: Of course I’m talking to myself ” I need expert opinion ” ( seen on fb ) you can always ad to the rude ones ” while I’m giving advice my free advice to you is to learn some manners”. I do that too. I also have a habit of triumphantly announcing the product I finally managed to locate after some difficulty. Or I find myself singing the name of what I’m looking for. “Ceeeeerrrrial… cooooooffffeeeee.” I get a lot of strange looks in the grocery store. omg I do this. People always stare at me funny and I pretend I did it to amuse my sister. I’ll literally shove it in her face and repeat, “Miiiilllllkkkk” all the while glowing bright red. I do this. Almost all of this. Reading signs and repeating things and QUOTES. QUOTES ALL THE TIME! Quotes! My daughter, who isn’t autistic, is very echolalic in this sense. She and her housemate not only do quotes but the accents and voices of the original speakers. It just occurred to me that I’ve long had a habit of quoting from movies and TV, usually triggered by something said by another person. Month Python is a very fertile source of quotes: any time I hear the word “individual” I *have* to repeat the “You are all individuals” dialog. Even if it’s only me paying attention while the conversation continues around me. My friends and I used to quote Monty Python quite a bit. (Three of them now live abroad and my social life is now very scarce). I can’t count the number of times I’ve said that! It’s triggered whenever someone says “nobody expects” or if they mention the Spanish Inquisition. And if anyone mentions Spam, I break into song. Quotes was my first thought! I know lots of people who consider a movie line to be a perfectly acceptable answer to, well, pretty much anything. I know I do. To come back to echolalia, my little aspie never used the word “yes” until he was 3 or so; instead, he used to repeat the question in an affirmative form (“do you want more milk?” – “you want more milk”). But de did use the word “no” quite liberally and emphatically. Now that he’s six, he repeats new words and phrases that catch his attention to himself in a low, slow tone of voice (“David’s mom is saying he’s still under the weather today and won’t be able to come ” – “under the weather”…) . It’s the equivalent of “my, what an interesting phrase, I’ll have to remember to use it some time”. As a kid, I used to infuriate my sister by reciting dialog along with movies. My favorite movies, I could do from front to back, and I could tell you which cut was showing based on what dialog they went with. A friend I had a few years back and I would have a game where we’d repeat a single line from a show or movie at each other, progressively exaggerating the tone and intonation used by the original actor until one of us cracked up laughing. She usually won because I’m not as good at making my voice do funny things. Fascinating post. I really enjoyed reading it. The term is new to me but the habit is not. I am aware of the distance between me and the people around me and even those closest to me and whom I care for so deeply. In learning how to emulate NT behaviors I realize I rely on this habit as a means of efficiently connecting myself and another person through a shared phrase as a form of emotional shorthand. I think it works but as I grow older I feel like I’m becoming equally aware of how often this “trick” fails when the listener doesn’t understand the reference. You don’t win or fool them all eh?! Sometimes it’s those common phrases that my wife knows that feel like our strongest connections. More than just the shorthand, I feel like they’re our special language. It connects us because we both remember the significance of that exact phrase. I wouldn’t change this for the world. I found your comments on your partner’s influence on your own speech really interesting. I notice that I very quickly emulate other’s speech patterns during a conversation. When I’m most aware of this is when the speaker is speaking with an accent. I know I’ll start to copy that accent and pattern and it’s not always appreciated so I work quite hard to not do so out of respect. I think most relationships develop the sort of shorthand you describe, though perhaps to differing degrees. It creates a feeling of closeness and sharing between people, especially when the words reference good memories. The trickier form of echolalia is the one you mentioned where no one gets the reference. That can be a bit awkward or disappointing. The accent thing can be really embarrassing! And also hard to suppress. I’ve been thinking about this post all afternoon and enjoying the retrospection. I realise that most of the people I have in my world are ones who have been here for a while. As such, most of the phrasing that might come out stands a pretty good chance of being something that is relevant or is close enough that the listener can figure out my reference or something pretty close to it, or at the very least something close enough that it’s reduces the akwardness. However, I forgot that there’s a population of people in my world that have also been around equally as long that don’t know me as closely and those are the folks left out in the cold when I’m really reliving a moment. I also use non-interactive echolalia, which could be seen as having obsessive thoughts, I guess. I will repeat, “OK, I need to do x, I need to do x” or disguise it as a conversation like “The coffee spilled on me. I am so stressed out. I went to clean my shirt. I’m really stressed out” [talk about something else for awhile] “I’m really stressed out” but less obvious. If you listen carefully and don’t engage at first, it’ll be pretty clear that it’s not info-dumping or conversational. I wonder how much of our everyday speech is self-directed? I feel like quite a bit of mine is. Some days I say more to myself (out loud) than to other people. I bet the majority of mine are self-directed. It’s like my brain doesn’t want to work on it, so it tells my mouth to do the directing instead. So when I make the short drive from my house to the grocery store, I’m giving myself verbal instructions. I can repeat a phrase, stim, rehearse (practice makes for a calmer me when driving :D) and self-direct all in just 3 minutes. I want to add that maybe the movement of the lips could count as stimming as well. I do a lot of verbal self-directing too, probably to supplement my terrible short term memory. And yes, talking as stimming feels accurate, whether it’s because of the lip movement or the sounds we make or whatever. Wow, I do all of the above at varied times. I knew it was due to how my brain worked but I did not have the official name “echolalia”. I also mimc and can do someone’s speech, gestures and persona. It’s esp embarrassing with people with accents. I am trying to get a hold of that one because it sounds like I am mocking them. German, Indian and Mandarin accents are my most pronounced and my husband will glare at me to remind me I am doing it again. Sigh. This was long. I could go on but you get the idea! I really related to this post! It’s sounds like you have a particular gift for imitation, maybe thanks to your early practice from the movies. Movies from that era are a great role model for social graces and formal speech, but also for the dramatic. I don’t think a lot of people realize that emulating speech patterns, etc is a form of echolalia. I knew that I did it unconsciously but had no idea why until recently. And yes, Canadians do have an accent to the American ear. To me it sounds like a Minnesotan accent but maybe Minnesotans sound like Canadians? It is very interesting that mimicking other’s speech patterns and accents is a form of echolalia. My mother does that, to a point that she worries people will think she is making fun of them (she starts talking to a stutterer and after a little while she is stuttering, for instance). I don’t know if I do that (certainly not to her degree!) but I do speak to myself a lot (to keep focused in what I am doing, to think better, to describe to myself what I am doing (this is unconscious, not deliberate), to interact with objects (even if I am an adult, I talk to inanimate objects, and not just to the computer), and to calm myself in stressful situations, doing a kind of self-reassuring discourse). Not echolalia, but still something a bit odd for some people. Speaking of unusual speaking patterns, I remember I was mocked at school for my exaggerated intonation of interrogative vs. exclamative vs. imperative vs. declarative sentences. We often had to “repeat this sentence as an interrogative”, etc., and I always erred on the side of exaggerating. Another aspect of the same is that I am sometimes told that I sound as a professor or (if the person is feeling unkind) a pedant as sometimes (didn’t find a pattern yet) I enunciate my spoken sentences (in conversation, in informal settings) in an unusually clear way, as if I were teaching (I did teach for a time, but I already did that before). Does any of you do the same? It’s actually one of the reasons why I’m eternally grateful for getting enunciation lessons when I started studying English in university. Because in English, I learned about voice modulation. I was taught this was why Dutch people sounded “flat” in English, because they didn’t modulate enough. I soaked it all up like a sponge. Or some soaking-up thing that doesn’t start leaking. Anyway. I applied those lessons to my Dutch speaking voice as well. AND IT WORKED. People suddenly started telling me what a pleasant phone voice I had. That I should work in radio. That I should do audio books. How expressive and nice I sounded. That I sounded warm and understanding. That I spoke so clearly and how easy it was to understand me. And in my head I kept thinking: “It’s a TRICK you people! Can’t you even tell what I’m doing?! It’s all FAKE!” But there’s no denying it’s helped me immensely in my career. Not related to echolalia, I think, but I have conversations with people who aren’t there. It seems to be a kind of thinking out loud, it helps me come up with reassuring thoughts and counterarguments, that I wouldn’t have come up with otherwise. Also practicing upcoming conversations or repeating/redoing conversations I had (‘correcting them’). For a long time I was worried I was ‘turning into my mother’ (who is manic-psychotic/schizofrenic/something not good) because she seemed to always talk when there was no-one around. I have had several therapists tell me it was not a sign I was turning psychotic, if I have already been doing this all my life. But definitely odd, and I always worry people will hear me. I don’t do this out loud, but my thinking process sometimes has a “conversation” between different parts of me (I used quotes because not all these parts of me use verbal language). I have had 2 mental health professionals react differently to my saying this: one reacted like this was an unusual, but benign, way of being, and accepted the idea that different parts of me express thoughts and feelings in different languages; the other basically spent 2 hours asking diagnostic questions (the fact that I phrased “I have different voices in my thought and they talk to each other as I think” probably didn’t help :P), and ended up concluding that I “should be simpler, shouldn’t complicate things”. I also imagine and reimagine a conversation with people (real and imaginary) when I need to process some issue in detail. This is one of the best descriptions of echolalia that I’ve ever read. I was pretty convinced I did not do this, but I am really big on text to speech, to the point where my husband often looks at me as we drive down the highway and asks if I have to read every. single. sign. Well, uh yeah. It feels compulsive to me. I also mimic other people’s speech patterns, and it’s hard to stop. My mom wasn’t a native English speaker and I’ve retained a lot of her patterns, but if I spend any time around any accent different from mine, I pick it up naturally. Right now I’m in the middle of watching a ton of Korean programs and their inflections and especially exclamations are really stuck in my head to the point where I need to repeat them under my breath. Text to speech! I read signs all the time when I pass them. And people ask “what did you just say” because they think I’m talking to them and it’s confusing. Such an excellent way of presenting this info! I must pass this on! I always latch onto a word or phrase and then find a song that uses it, or close to it. So if someone says “What a great day.” I am compelled to start singing the Mr. Rogers theme song: “It’s such a good feeling- this feeling inside. It’s such a happy feeling, to know you’re alive and when you wake up ready to say: I think I’ll make this a very good day!” Etc. Usually, the song or song phrase is from childhood or my young adulthood. I don’t often do this without the song aspect. I could not find this in any literature on echolalia. I also compulsively repeat the sounds cats and babies make and pick up phrases and speech patterns of others easily. Writing this out, I’m wondering if I’ve focused on forms of echolalia that wont’t bring me to anyone’s judgmental attention. I’ve blocked out most of my childhood, so don’t remember doing this another way. Does anyone else have this experience? Especially with the singing?? Yup. I sing a LOT. I talk to my cat by singing things to him in the tune of “Jesus Christ Superstar” (often mutated into Crazy Cat Superstar). I also get songs stuck in my head BIG TIME just because of a single word I hear or see or think about, and they all have associated songs. I also have OCD traits, so always have a song running in my head. It’s a nightmare, because sometime I get so SICK of the songs! Sometimes I even have a song on my lips, another running in my upper conscious mind AND another one in my subconscious mind. Oh my goodness yes! I always have music or songs in my head. Often in the background of other thoughts or songs… Exhausting as you say! I also get words or phrases stuck in my head, often as I think them or someone I’m talking to says them. There will be a distinctive rhythm or sound to them that then goes around and around in my mind. I often won’t realise until I’ve gone space cadet and “come to”, snapping back to reality. Awkward if I’m supposed to be listening to someone. I also spell the words or phrases with my fingertips as if touch typing. Again I don’t realise until I’m in the middle of it! Oh yes, animal sounds is something that I’ve seen a lot of anecdotal mention of by autistic people but it isn’t included in official descriptions of echolalia. I’m not sure about the singing. Certainly if the original speech was a song then it seems like an echolalic repetition of it should be in song form. I think it’s definitely possible that you found acceptable outlets for your echolalia if other forms were discouraged. I can’t remember if I was echolalic in childhood or not. Probably because it’s such a natural thing that I wouldn’t have noticed unless someone else pointed it out. I do know that I still use phrases from my childhood sometimes now. In fact, a bunch of my posts are titled with phrases referencing childhood TV shows or books. My whole family does this! Especially animal sounds! I’m NT but I do this all the time. I am always thinking of a song that goes with a phrase. The only ones who appreciate it are the kids I work with. I don’t know if you have read this, but there is a book called Musicophilia by Oliver Sacks that discusses all the ways music interacts with our brains. For clarification, I do it in a way that I THINK appears fairly organic to the moment and has never made anyone think I was mocking them. But then again, I realize I don’t have a very good handle on what others are thinking about me. I tend to break into the Fraggle Rock theme song in public. Yesterday, as a matter of fact. You all are my age, it seems 🙂 And all TV stations in Western Europe had the same children’s programming, too. My go to song for endless repeats is “Mana mana”. No! Don’t say ‘mana mana’! LOVE this post! One of the most clear and thorough explanations of echolalia I’ve ever read. I should pass this on to my therapist…who still seems to think that Autistic people with “functional” language don’t use really use echolalia. *rolls eyes* I use delayed echolalia all the time. I use movie quotes during interactions with people SO OFTEN that a trademark comment of mine is, “Oh, everything is a movie quote to me.” I accompany that with a chuckle, and somehow it helps people look at me less oddly (because of course, the majority of the time the quote makes absolutely no sense to anyone but myself). Also, OMG, I love what you said about mitigated echolalia and how you repeat questions to yourself. I DO THAT TOO. The example you gave is exactly something I would’ve done/have done. You’re right–it is slightly amusing to people, and it’s so much better than staring at them or the ceiling blankly. 😛 The rehearsal echolalia is pretty much the story of my social life (everything is a script to me), and lastly, the imitating of a person’s tone of voice, pitch, rhythm of speech, volume and/or inflection…SO ME. There are certain people around whom this happens more often…usually if they have a really dominant personality and I feel slightly overpowered by them. I have two friends in particular that I tend to imitate a ton. My imitation of their inflection and rhythm of speech with continue for daaays after I see them. I’m glad you touched on this, because you’re right–it’s not talked about as often. But I think it’s fairly common. So yeah. Awesome post. Definitely sharing. Can you delete this comment? I didn’t mean to post it under my full name. >_< If you could do that for me, I'd really appreciate it. Then I'll repost it under my nickname. I shortened it to the name on this comment. Does that work? Yes, that works perfectly. Thank you! Thank you! I think most people who know what echolalia is assume that it applies mainly to people with less developed functional speech but the more I looked, the more examples I found in my speech and after reading this my husband was pointing them out too. Then I came across an article that said echolalia tends to be a lifelong thing to some degree, even after the development of functional language, which makes a lot of sense to me. I know what you mean about retaining another person’s speech patterns for days after being around them. After reading what you said here, I think how strongly I pick up speech patterns is also influenced at least in part by how much I like/admire the person and by how “big” their personality is or how unique their speech is. I rely on echolalic scripts a lot more than I used to think I do. I used to think I don’t use it at all, now I realize a lot of my smalltalk is delayed modified echolalia. It’s much easier to use echolalia than it is to think up original small talk. Hey, did you get my email about the survey follow-up? I had a few questions for you. Yeah, I just replied to it. Had to think a bit about how I wanted to phrase things. Cool, thank you for getting back to me. I felt bad after asking this because I later saw your blog posts about being really busy and exhausted. I’m so behind on reading my blogroll. You just made me realize that even I have scripts. For small talk (with people I have nothing in common, because as soon as I have some common interest I direct the conversation away from small talk into interesting random facts or questions) and, oddly, for telephone calls (even with my family, until a real conversation gets started, I tend to say the exact same phases and ask the exact same questions). Scripts are also something I learned to use in therapy for phone anxiety — consciously using stock phrases in this case, which has been a *lot* different to the echolalia-related repetition I do without thinking. I quite literally cannot do small talk. I will just automatically jump into deep interpersonal discussions, heartfelt soul-confessions and peer counseling and all- even if just waiting at a bus stop. If I’m not up for talk then I pretend I’m furious with someone so I look unapproachable. I recognize this, too. Just using a phrase I heard before, in order to get through the conversation that is not supposed to go any deeper. This is so thorough! I love it! I recently figured out that there’s actually a term for what I usually do which is slightly different from echolalia: palilalia. It’s basically echolalia for yourself. I think that personally, I have a hard time understanding others’ speech unless I’m focusing really hard, so I usually end up doing echolalia things with their intonation or prosody instead of their words. On the other hand, I put a lot of thought into crafting my own speech and I do it so that it sounds a particular way, so when I hit a word or phrase or sentence that has a nice ring to it, I don’t just say it once, I say it over and over, and sometimes it just pops up for the next few days. When I was a kid I would repeat a word to myself so often it would lose all meaning and become a foreign sound. I would even become unsure of how to spelling. I’m talking about words like “run”. Oh, this happens to me sometimes. The word suddenly seems to make no sense at all, like it’s not even a word anymore! I get the same thing sometimes when reading. I’ll be looking at a word on the page and suddenly it looks wrong, like the letters have become jumbled up. It’s a terrible distraction because it halts me in my tracks, and I have to work hard to convince myself that, yes, it is correct before I can carry on. Playing with words is fun and some have such a pleasing sound or feel or shape to them. Like when I ran across idiopathic in the wikipedia article it made me irrationally happy because for some reason I like idiopathic a lot. I like how it sounds and I like that there’s a word for what idiopathic means (does that make sense?). Okay, that all sounds a bit odd even for me . ..
Is that where you say, out loud, “just keep swimming” or “you can do it” or “once more into the breach”? I do find saying those things helps me gird up my loins when distracted, feeling overwhelmed and so on. I thought I might be overdoing the self help books, but it turns out I’m a sucker for positive affirmation, even if I supply it myself. I’m not sure whether to be ashamed of my weakness or proud that I can self regulate effectively. I have always started talking like people I am around who have accents or from a different state (Missouri) 🙂 I do it quickly and I recognize it and try to stop before they realize I’m doing it. When we lived in Mexico my English started sounding like broken English, with a Mexican accent. I’m still not sure I’m an aspie, but I am starting to see more and more aspects I have or relate to as I am learning about it. I hadn’t really thought I did that echolalia a lot, but like many things I read in the literature, I just didn’t really make the connection between what I read and what I do. This is quite a coincident, because this week I was noticing more and more that a lot of things I see or do are associated with some movie quote or radio jingle or something like that. E.g. when I see a pigeon, I always say/think (Ernie saying to Bert) “look, Bert, a pigeon” (but then in Dutch, with the tone and accent of the Dutch voice actor). I have fixed phrases for when I see a pedestrian’s traffic light go green as I approach it, a radio jingle when I hear the word ‘weird’ or think something is weird, and so on. And I think a lot of people (ASD or not) do this, but this does feel like a lot. It kind of reminded me of “Scott Pilgrim v the world”, where he seems to see video game things all over his life. Also, the imitation. I am often considered to speak a language fluently, when in fact I’m not that good. And that’s really not me being modest. I can speak several languages seemingly like a native, because I have the accent down quite quickly. If I have a sentence ready in my head. But then there’s finding the right words. So there I stand, in a shop in Moscow, asking a question, with the right accent and all, well prepared while they were helping the previous customer, and then there’s the answer …O.o… Don’t understand! When I learned I was autistic I finally understood my problems with understanding other languages, and now I understand why I (seem to) have less trouble speaking them. It seems a bit like we break speech/coomunication down to bite-sized bits we repeat, have ready as a reaction, understand to mean a certain thing, or have a reaction ready to. The world stays understandable and foreseeable in this way, at least these bits do. Oh man, Dutch Ernie sounds like fun. I do think that everyone uses quotes and repetition to a certain degree but it seems like autistic people do it to a greater degree or perhaps even use quotes in a slightly different way (more often as communication than as humor or a bonding device). That’s a really good point about learning a foreign language. Sounding like a native speaker because you can mimic an accent with some prepared phrases is much different from being fluent in grammar and having a wide vocabulary. I bet people have higher expectations of your language skills as well because you sound fluent thanks to your imitation skills. Wow. That’s happened to me in foreign countries when I say a common phrase in a foreign accent. And it’s always made me feel great to be mistaken for a native speaker. I have also picked up accents here in America. Whenever I spend time with my Southern relatives, I pick up a drawl and a twang. And I get teased here in the Northeast. I’ve always found it to be fun and quirky. I know other people this happens to, too, so I never associated it with ASD. I definitely get triggered into song by phrases I or other prople say. When I’m with friends, I let loose and they find it endearing and quirky. With other people, I don’t sing it out loud, but I sing it in my head. Not sure if anyone else has this, but when I’m alone, conversations I’ve had earlier in the day run through my head. If I’m annoyed about some dumb thing I said, I get into an echolalia thing. I’ve always found it freaky and scary and a sign that I need to rest. I recently watched a movie where a character was reliving conversations from troubling periods in her life and verbalizing them in public, and it was a sign of psychosis. For me I’m definitely conscious of what I’m doing, and if someone were to walk in on me, I’d definitely be to snap back to normal, whatever that is. LOL. Everything everyone has been saying on this one has definitely resonated for me. No pun intended. Even if the pun wasn’t intended, I still love it! Resonate resonate resonate. It’s a wonderful word! And I don’t think you have to worry about a movie thinking it’s a sign of psychosis. Movies often get things completely wrong. Even therapists and scientists get things wrong sometimes. The brain is still mostly a mystery, and NTs sometimes lack the empathy to realise that what’s normal for them doesn’t need to be normal for us. There is a tendency to pathologise everything that deviates from “normal” instead of trying to see if it’s actually an impairment for the person themselves. I do this, the replaying conversations. I always felt that it was triggered by a degree of stress that was a part of that moment. If I was uncomfortable during that conversation, I find myself replaying it later on and working through scenarios to try and test what might have been the better path through that event – as if I could revisit it later on for a different outcome. I had to stop the singing thing. I used to notice it would happen and only rarely would the reference make sense. I’d be embarrased for quite a while afterward and started to try and track what would be going on in my head before I let loose on the tune to try and stem it. I’m not especially happy with the idea of preventing a part of me from happening but it’s less of a negative feeling than I feel when I do pour it out and I realise I’m the only one in that moment. Definitely repeating conversations, I think also as a way of processing them. But when I worry about something I said wrong, it keeps coming back and back and back. I’ll repeat the conversation out loud when I’m alone, trying to correct it. They do (have higher expectations), and then it feels even more awkward when I can’t find the right words. On a funny note this may explain why I sound like I fell out of the 1800s during a recent obsessive Pride & Prejudice fan fiction reading period … It was very “vexing”! Do you think immitating the style of writing from fiction you’ve read comes into the same area as immitating the style of speech of people you’re spending time with? I’ve gone through periods where I found myself imitating fiction writing styles and I can mimic different nonfiction styles as well. I’ve done some ghost writing, which requires being able to mimic an author’s voice fairly well and I think I was reasonably good at it. This is probably a form of echolalia because I hear the words in my head as I write (if that makes sense). Hope I’m not going to cause a rift in the space-time continuum by commenting on a year old post. Just went thorough all the stuff on echolalia to see if anyone mentioned the writing thing – and they did! I’m used to the various vocal versions as my dad (definitely aspie) does the thing where you adopt the accent of the person you are talking to, my husband (claims not to be aspie…) constantly talks in quotes from Monty Python/Dr Who/Hitchhikers/Spinal Tap etc etc – to the point where I know the correct response to many comments even though I never saw the original sketch/movie, and my 10 year old has recently taken to singing radio jingles repeatedly. I don’t do these things so much (although I do talk to myself and rehearse conversations) – but I have got something odd going on with my writing style. When I was at school I was very precocious in my writing ability and I seemed to do this partly by being able to mimic the style of something I had read. This only occurred to me when I found a story of mine published in a school magazine at 9 or 10 years old in 1975, and in its tone it was very formal and twee just like a 1940s school girl novel – I guess I had read all my own books and started on my mum’s old books. I also wrote poetry, and occasionally got accused of copying – not because anyone could prove it, but because they sounded like other poems in subject matter and style, and were not how they expected a 9 yr old to write. I think this may have followed me to uni, as I remember a few psychology essays with the comment “inappropriate style” which my tutor refused to elaborate on, and an essay in my final year where I had correctly attributed all my quotes, but was still told off for plagiarism as my own conclusion read like it had been copied from a text book! I still sometimes get in to trouble with over-formal or wordy emails (or comments 🙂 ), but I generally subconsciously mimic the style of the person I am writing to in tone and structure. Even commenting on your blog I find myself tempted to use some of your usual phrases, and to use American rather than English phrases. Is this echolalia or something else autistic? I think it’s a form of echolalia. I do it too, often picking up the tone of my intended receiver (if I know them well enough) in emails and other online conversations. I guess we’re just unusually prone to picking up “accents” of all forms. I have exactly the same skill at imitating writing styles and had exactly the same experience at college of my own writing sounding like a quote. I have always been told I write really well. I’m borderline mild Aspergers but I would never have connected that to it. My son with autism is very echolalic, in fact, most of his conversations with me are scripted. He expects me to reply to each statement exactly the way I did when we first had the conversation, no matter how long ago that was. When my reply is different, he corrects me by saying what I’m supposed to have said. Sometimes he’s more receptive to changes in the conversation than other times. This gets tiring but I realize as his mother, I’ve been his connection to the world since infancy (which he remembers), so I’m the one person he can talk to the most and be understood. It’s one way he is expressing his love for me, which is very precious. That’s kind of adorable that he insists you repeat your part of the script. I think the most important thing is that he enjoys engaging with you via echolalia and you see the value in that. There’s a special bond that develops when someone knows my scripts and neologisms and is able to play off them with me. I bet your son feels much the same way when he runs through conversations with you. my son shows certain elements of echolalia often, and I am trying to decode them to react to them (or not) in the right way. it seems to be one of the things that is extremely difficult to grasp for people as he is quite articulate when on focus but uses language or certain words from other situations to express emotions. for outsiders, it seems pretty unconnected and strange. When you know the context and some background to why and how echolalia is used, it makes perfect sense. How well echolalia can be used to communicate is heavily dependent on how much the listener can interpret. I think parents are in a unique place to make the most of echolalia in their children because they’re present for so much of a child’s early life and often have the original context of echolalic phrases. It’s great to hear that you’re able to interpret a lot of what your son means and that you accept his echolalic speech alongside his other more functional speech. (Not trying to derail the conversation, but can I just mention how much I LOVE your comics Suburp? They’re brilliant! Ok, fangirling over. Please continue). How common is echolalia in NT people? My (supposedly NT) partner does this more than I do, to the point where it has caused problems between us. He will very often immediately repeat word for word something he finds funny, whether on the TV or in real life. This has caused problems between us as he has mimicked my stutter when he thought I was just being funny. He also mimics people’s accents, and has taken on some of the phrases that I use as an Irish person, but will use them in the wrong context as he still does not understand them fully. From your description, I kind of wonder how NT he is too. 🙂 Not only the mimicking/echolalia but also the fact that he doesn’t see the social faux pas in mimicking your stutter or misusing phrases. I don’t think a strong tendency toward echolalia is common neurotypical people. I think most NTs do it casually and often for social effect, if that makes sense. Echolalia is also associated with other conditions, though, like schizophrenia, Tourette’s, Alzheimer’s, and some brain injuries. “a tendency to pick up phrases and speech rhythm from other people” — oh my! This made me realize I do this *all* the time: and then keep using those people’s own phrases when I’m talking to them. I wasn’t very aware that I do it, but now I think about it, looking back over the years, it’s a wonder people haven’t accused me of mocking them by my mimicry. Holy crap. I just remembered the remark from my German teacher during my final exams, when I was talking in German about the books I had read for my finals. He asked me why I had a Thuringen accent. I’d spent a couple of weeks there during summer. Musings wasn’t kidding when she wrote it “creeps up on you”. I’m going to have to be careful not to become self-conscious about this — the last thing I need is to feel under *more* pressure in social situations! God. I’m so chipper and positive I sometimes want to strangle myself. It might be one of the weakest, most fallacious arguments I’ve ever constructed but I *like* it!! For some reason I heard your last paragraph in the voice of Marvin from the Hitchhiker’s Guide to the Galaxy (original radio production, not the movie). It seemed to fit. Don’t ask me why… I’ve got this pain in the diodes down my left side. I love your fallacious argument, works for me 🙂 Sometimes I notice we do the things autistics are not ‘supposed’ to good at (like empathy) ‘better’ than most NT’s I know. Typical, that. More normal! 🙂 Mirroring a person’s mannerisms and speech is also an excellent tool for humanizing yourself to your captors if you’re ever taken hostage so there’s another area we have a leg up on the rest of the world. Yes, “be taken hostage” is very low on my list of life goals. I often repeat questions/statements back to people after they’ve said them; as with the example above, I usually auto-correct the grammar so I’m “I” not “you”, etc. Echolalia (including text-to-speech) as stimming is definitely something I do a lot. A LOT. As I may have mentioned* (*failed to shut up about) previously, I reeeeeeally like Doctor Who, and last week I was linked to this YouTube video https://www.youtube.com/watch?v=L1WrFo05Vys – it’s a compilation of all the 2005-onwards occasions where the title of the episode is said *in* the episode. There is an episode simply called “Dalek” which, as you can imagine, contains a LOT of these title drops. 22, to be precise. So after the video finished, I sat there for a good few minutes repeating “Dalek Dalek Dalek Dalek Dalek” to myself. Then I made a cup of tea whilst repeating “Dalek Dalek Dalek Dalek Dalek” to myself. Then the next day I re-watched the video purely because DALEK DALEK DALEK DALEK DALEK!!! In addition, I sing/hum to myself a LOT, and often that’s just the same few lines of a song over and over again. (Possibly the reason why I absolutely loved Get Lucky so much!!). My brother tells me I always inadvertently try and mimic the accent etc of the actual singer, but I was under the impression that most people do that. I also have a habit of repeating words when I’m thinking. For instance, at uni last term, we were walking somewhere-or-other when somebody asked if any of my French class were from Magdalen college (I should add that it’s pronounced “Maud-lin”). I just started repeating “Magdalen Magdalen Magdalen Magdalen…” without even thinking about it, and the other person pointed this out before I’d even noticed I was doing it. Possibly also related – if I’m stressed/overloading, my speech goes a bit haywire, and one aspect of this is that I get “stuck” on certain words or syllables and just repeat them because I can’t finish the sentence. Not really sure if that’s *quite* the same thing, though. I really like the idea of text-to-speech echolalia and didn’t see it mentioned anywhere in the research that I read. (perhaps because so much of the current research is on younger children who are echolalic) It’s good to see that others do it too. It’s interesting how many people mentioned foreign languages. I always struggled with getting the accents right in French class but I think it’s because I’m not a very fluent speaker basically, so making myself speak in class was always a chore. Ehm… doesn’t everyone strive for that? 🙂 For me it feels wrong when it’s not in the same accent as the singer, it’s like a different tone. This was really amazing to read. My son doesn’t seem to have this – although when he’s interested in something scientific he will go into “educational mode” about facts he’s learned and repeat what he heard on a science program. Not sure if that’s related… I forwarded this to his Speech Pathologist – I’m sure she’s familiar with it, but this was such a great breakdown that I had to share. Thanks! What your son does sounds like monologuing or infodumping. I wrote a little about it here: https://musingsofanaspie.com/2013/07/09/an-open-invitation-to-infodump/ It’s a pretty common thing for autistic people to do, especially when we get excited about something. Best article I have ever read about Echolalia. My daughter displays pretty much every form you described. Wish I could have directed another parent to this a few years ago when she wanted to know why my daughter was calling her a snow blower. I automatically knew she’d been saying a line from short circuit at school but my explanation did little to reassure her it was not an insult. It made me laugh as this was a mum that liked to pretend she was a friend but was just looking for gossip. This is a great article I can really relate to it. My daughter’s vocab is great so immediate echolalia is often a sign she’s in overload but had never seen it mentioned anywhere before now. Wow, basically all of this happens to me but I didn’t know all the terms. Thanks! Labels are really useful when explaining/writing about stuff. When I’m stressed I recite poems to myself. I’ve been excited to learn that so many of things I do have names, which allows me to read and research about them. It’s interesting that poetry plays such a big role in your echolalia. Now I’m curious whether it’s a special interest of yours or it just happens to be the focus of your echolalia at time. After – can’t remember why – scoring 126, then 130 (when I took it a second time and intentionally tried to bias my score downward) on the rdos.net test, then some others, though now I realize they are mostly all based on the same,, nevermind. But this post smacked me between the eyes with the last paragraph. I’d spent three days skiing in Canada, and had a hell of a time convincing the Canadian I was sharing a ski-life with that I was American, and didn’t live in Canada because my accent was clearly local. Same thing happens when I work with clients in Minnesota and North Carolina. Then I re-read your post, and yeah, I have a set of catch-phrases I use a lot, many of them from popular culture or movies. I’ve created a standing joke with another client with the Dr. Phil line “What the hell were you THINKING?” delivered in a rich Texas accent. Anyway – I am just exploring and learning (yeah, I’ve got 14 tabs open right now… oops), and really appreciate what you’ve written here. The infodump post – well, I KNOW I have finished a long explanation with “and that was a long answer to a short question” when the person was probably just looking for affirmation. I’ll try to do better. I’m beginning now to understand what “Maybe this is a good framework for you” means. First, I have to say that quotes from “2001: A Space Odyssey” freak me out a little because I “watched” it when I had the flu and was drifting in and out of consciousness due to a high fever so it was all the more surreal. Thank you for letting me know you’re finding the posts here helpful in your exploration. I remember those early days when I was reading everything I could get my hands and constantly feeling smacked between the eyes by what I was finding. It definitely gets less shocking with time. I’m blushing again. 🙂 Writing feels like a huge responsibility when I read a comment like this and it’s good to hear that I’m not screwing it up too badly. Thank you for the kind words and also for trusting me to be a part of your journey. That means a lot. I hope you don’t find it a burden! You just write about things in such a positive way. People can take from it whatever they feel like taking. I’m far more opinionated in my writing, which sometimes means I need to backtrack and admit my mistakes, for fear of causing harm by what I say. I don’t think you have to worry about that at all, because your entire message and attitude is so positive. Yeah, I’ve got 14 tabs open right now… oops! Pfft, if you think that’s bad, I’ve got 21 tabs open. On an Android! Excellent article!! In addition to being the mom of an 18 year old with AS (who is very echolalic, but I may be the only one who notices because he’s learned to repeat things appropriate to the conversation), but I’m also an educator who works with children with various types/degrees of autism. May I include this article in my packet for parents whose child has recently been diagnosed? Fully credited, of course. Thank you, I would be honored if you included this in your packet for parents of newly diagnosed children. I’m always happy to give permission for people to reprint articles (with credit, of course) if they think it will be useful. I hope you don’t mind that I linked to this post on a discussion post in LinkedIn. Many of the members are non-autistic practitioners, professionals, etc., who are truly interested in helping, but it seems like they aren’t t aware of the amount of first person info available through adult autistic bloggers. I’m doing my best to signal-boost autistic blogger posts whenever they fit. I’m NT, but several family members are on the spectrum, both diagnosed and not, and of all different ages. The more info that gets out there, the better. Just a note on the last bit about when Echolalia sneaks up on you; I’m not a native English speaker, as mentioned before on a different post. People in South Africa generally have a specific type of accent when they speak, and this is different between the native English speaking people and the none-native speakers, which can generally be distinguished. Afrikaans speaking people often has a bit of a harder, stronger accent. Many people has asked me in the past where I am from, because my accent sounds foreign to them; different than what they are used to hearing, so they think I’m from a different country. They usually say it sounds like I’m European. I have never thought that I speak English in an accent, especially not one so much different than everyone else’s. The interesting thing is, I don’t know where I have picked up this accent, because where most of my English speaking skills come from, is watching television, which almost always consists of American television; the usual movies and comedy series created in Hollywood. It very rarely, if at all, consists of any British or other European shows, and almost just as rarely any other locally produced shows. That’s interesting. Maybe your English speaking accent is a mix of American English with the “accent” of your first language, which somehow ends up seeming “European” to others? I know what I’m trying to say but not sure if that makes sense. Oh my goodness…The last paragraph, When Echolalia Sneaks up on You. I do that! For example, a gentleman from England thought I had an English accent (I don’t, and cannot mimic it on purpose)–I was just picking up on his tone and speech patterns! I’ve been privileged to speak to people from all over the world due to my job (even though I’ve never travelled outside the U.S.) and I have to be careful not to do this–I don’t want anyone to think I’m mocking them! Also, the part about rehearsal. I often write out what I want to say before making a phone call. Even if it’s just a silly phone call, like to order pizza. I have a pretty good memory, so it’s not like I don’t remember what I want on my pizza, it’s just that I hate talking on the phone so planning out what I say before I make the call takes care of most of the anxiety. Oh gosh, working with international business contacts sounds like it’s rife with possibilities for accidentally mimicking people. Scripting is a huge help for making phone calls and navigating interactions where I have to accomplish something. I spend the entire time I’m waiting in line at coffee shops and delis rehearsing my order in my head. Even in places where I always order the same thing. Ah! 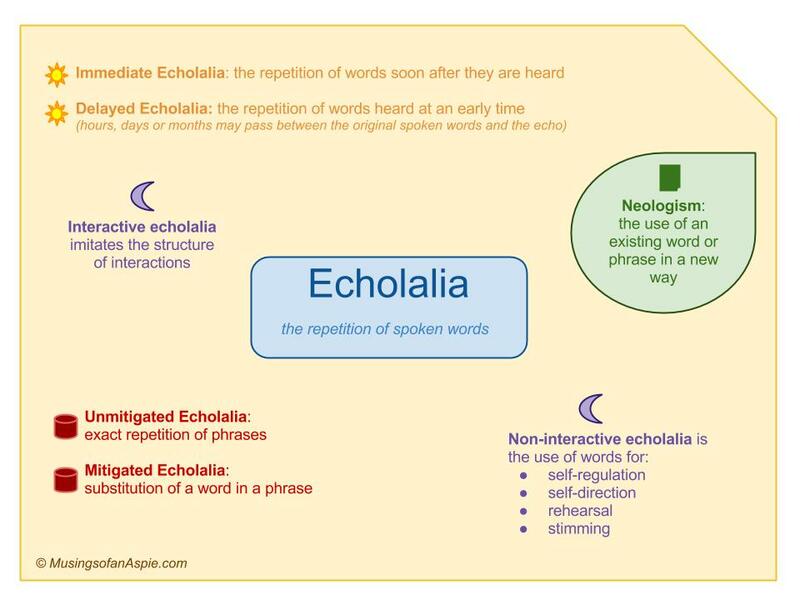 This has been the first post/site/description of echolalia that’s actually helped me with the question I had – because I mostly notice myself echoing when I’m watching TV or movies, or doing what you called text-to-speech echolalia. I also definitely think it’s partially a stim, because the lines in TV or movies that I tend to echo are either ones that have made me giggle in the past and i know they’re coming and i say them when they happen BECAUSE they make me laugh, or the lines that make me laugh when I’m not familiar with it, and i’ll say it a couple of times. It’s not always that, but it’s generally things that amuse me. I also definitely do things like your “bright sunny day” – sometimes they circle out of my lexicon and sometimes they don’t. “Eli’s coming” used to be an easy way to express a feeling of foreboding or uncertain anxiety, and it’s the first line of a song that has nothing to do with foreboding but was referenced in a TV show in that context, and now that’s what “Eli’s coming” will always mean to me, even if I don’t use it much anymore. Or, for example, whenever my wife and I are teasing each other, if one of us says “I’m sorry” and the other says “I am!”, invariably I will then add (no matter which side I was on) “I am, baby! It’s ’cause he doesn’t like Simon at all!”, in a very specific tone, echoing a line from a TOTALLY DIFFERENT context on a TV show that I love. It’s not even conscious half the time, it just comes out, but even if we’re both totally aware we’re teasing, it’s a good way to clarify that I’m teasing, or make sure my wife IS (because she always laughs or at least smiles when I do it). I don’t notice myself doing it all that much with real people with their own words, though, and I tend not to use my quotes and shorthands with people I don’t know well – is that common, do you know, especially for people on the spectrum who weren’t diagnosed until they were adults? That’s a great point about echolalia often being confined to the people we trust most. I hadn’t thought about it, but I am definitely much more echolalic around people I know well (or when I’m overtired and can’t inhibit my speech fast enough 🙂 ). Thank you for the kind comment. It always makes me happy to hear that a post has been so helpful. My mother and sister are normal (or as normal as we can possibly be), and for years it was just the three of us since we were homeschooled. We could carry on full, meaningful conversations strictly in random movie quotes, and nobody had any idea what we were talking about. For reasons I don’t understand, I’m often asked what country I’m from. Australia is the common guess. I have a thick Southern accent, how do you mistake that, especially the fellow Southerners? But I have listened to a lot of Irish music, maybe it’s stuck into my accentuations. Firstly, thank you so much for putting yourself out there in your blog. You are doing a great service! I have very recently been diagnosed with SPD (I’m 35). I am strongly suspecting that I am on the Spectrum, and several others have suggested the possibility as well. I am curious today about echolalia. Much of my childhood is repressed do to severe abuse that I endured. As I am learning more and more about SPD and autism (I also have a 10 yo step son who is autistic), some memories of my childhood are creeping back in. I am beginning to understand that I may have used echolalia as a child (I am still uncertain whether it was delayed, immediate or both) and that my parents used aggressive means to curb that behavior in me. That said, I have caught myself repeating words and phrases in my head (and I have done this for as far back as adolescence and early adulthood). Could audible echolalia be suppressed and become a type of echolalia that happens “inside” one’s head so that no one else can hear? Now being decades and thousands of miles away from my parents, I am finding that some of my behaviors are becoming more present and audible (like echolalia, I have found myself whispering words and phrases or even saying them full on out loud -though quietly still). Yes, I think echolalia can be silent, especially if a person was punished for it as a child or had it strongly discouraged in a way that made verbalizing feel unsafe. If you find that you enjoy echolalia or other traits that you’ve unknowingly suppressed, I would recommend indulging yourself and see where it takes you. I’ve found so much joy in rediscovering autistic traits that I’d “quieted” since childhood and it’s been a very healing process. The one thing that seems a bit treacherous is the link with abuse. It’s entirely possible that as you unearth these long buried aspects of yourself you might start bringing up other strong feelings as well (as you’ve alluded to here). I had to work through a lot of sadness and loss (of the not very terrible garden-variety, I suppose) post-diagnosis and sometimes it helped to back off a bit and let things rest before trying to move forward with the whole rediscovery/acceptance process. As an aside, SPD traits are an essential part of ASD and it wouldn’t be surprising to discover that your SPD is actually just a part of being on the spectrum rather than a separate thing unto itself. Good luck with your continued exploration. I know there can be a lot of ups and downs at that stage of the process but it’s worth it in the end. OMG, I have to fight the urge to do this at church when a certain priest is saying Mass. He’s from Columbia and his accent and speech inflections are so awesomely different than someone who spent their life speaking English. I can’t imitate his accent, but when he’s saying the interactive parts of a prayer, like “Lord, have mercy…” I have to fight the urge to put the same inflections on words as he does when I say “Lord, have mercy,” with the congregation. Sometimes I give in and do it anyway because it feels good. I love the repetitive nature of praying the Rosary every day. There’s something really comforting about holding/rubbing the prayer beads while repeating the meditative prayers. It’s also a great way to exercise my attention span on days when I can’t seem to focus on anything. I hadn’t thought of prayer as a form of echolalia but it has a really strong element of repetition and echoing to it, doesn’t it? There’s a final form of echolalia that gets discussed less often. In addition to being the repetition of exact language fragments, echolalia can take the form of imitating a person’s tone of voice, pitch, rhythm of speech, volume, and/or inflection. This is so me. I remember living in Carlisle for a couple of years, and although most people there have English accents, I still wound up with a Scottish one in a matter of months. Then the time I lived in Cheshire for a year, I was saying “Oo-ar*” in weeks! Also: Oh god. That thing about repeating questions back? I’m embarrassed by how accurate that is. I do it constantly when someone asks “How are you?” That’s the worst question. The answer is either “uuuuuuuuuuuuuuuuuuuuuuuuuuummmmmmmmmmmmmmmmmmmmmmmmmmmmmmmmmmmmmmmmmmmmmmmmmmmmmmmmmmmmmmmmmmmmmmmmmmmmmmmmmm………….. I have no clue.” or “How *am* I today?” or some charming little response that distracts them from their question. I’ve noticed that, when you make someone laugh, they don’t tend to pester you for a real answer. They don’t want to ruin the joke by dismissing it. Helpful! This article was very enlightening. I am researching echolalia because my friend does it non-stop and it drives me crazy. So I’m trying to understand it better (and also weighing whether I should confront him about it or not). Now I’ve read this article and I realize I do it too, particularly the text-to-speech or imitating familiar people. My family repeats quotes all the time! I didn’t realize it wasn’t a normal thing until I was probably around 10. I used to/still want to do the accent thing, too, but I think my mom trained me out of it because she was afraid people might think I was mimicking them and get offended. I play with words in my head sometimes, not usually out loud. People probably got annoyed when I was little, so I stopped verbalizing it. My daughter was born at 24 weeks 1lb 13oz. She had a 91 day NICU stay. We are blessed that that she is a beautiful, mostly healthy, incredibly smart 3 year old that avoided many of the hardships micro preemies experience. However, she is immune compromised, and has chronic lung disease, so the doctors recommended that we keep her quite isolated for the first two years. Her first year, we only allowed immediate family to see her, and I won’t go into our sanitation rituals before someone could come into our home, but they were intense. Our only outings were to doctor appointments. Her second year, we slowly began introducing her to new environments in an effort to build her immune system in a controlled way. All that to say that her main interactions were with people who knew her very well. I knew that preemies, and especially micro preemies, are at an increased risk for autism, so I tried to educate myself on the signs, and I took the Mchat several times. It always came back low risk. She always showed interest in other people, good eye contact, etc… She is the smartest little girl I have ever met. I always feel like people think I am just saying that because I am her mom, but at 3, her teachers think she can read. She knows all of her alphabet, shapes, colors, animals noises, can count to 100, spell her name, and can independently recognize all letter and numbers, plus more. I point all of that out not to brag, but to explain why when she started reciting whole dialogues from cartoons, and entire segments she heard her Dad say on the radio, it didn’t even register to me that it could be anything other than she was simply brilliant. When she started asking for things like, “Do you want to take a shower?” “Do you want to watch Mickey Mouse Clubhouse?”, etc… I just thought it was cute. Then, she started daycare through our local university. To make an already incredibly long story somewhat shorter, her teacher came to us and told us she thought we should have our daughter evaluated because she was having trouble with language. I didn’t understand. She has a huge vocabulary and can perfectly annunciate any word she hears. Then, I started to realize she never answered yes/no questions. She never used ” I”. She rarely recounted events from her day, or gave verbal opinions on things. Her dad, our family, and I had all compensated for her language barrier. We knew what she meant. She knew how to communicate with us. We had a rhythm so in sync that it took an outside person to make me realize something was even wrong. So, now here we are. After several months on a waiting list, we have an appointment to be evaluated at the best children’s hospital in our area. I hope I don’t sound insensitive when I say that I am terrified. Not because she will be anything other than our beautiful, incredibly smart daughter, but because I have been scared what this means for her going forward. I’ve been scared that maybe I would never truly know my daughter, and all the other typical things you mentioned in another of your posts that I read (friends, marriage, “normal” life). Then, I found your blog. The way you explain your experiences has made it so much easier for me to understand what my daughter is going through. I had the hardest time wrapping my mind around how she can absorb everything so easily, but could not answer a yes/no question. But, when I was reading this post, and you compared it to learning a second language, something clicked inside my head, especially the part about modeling. She had recently picked up “No”, but was using it to answer all questions. My husband and I had already been consistently correcting her when she asked for something using ” Do you want…”, by saying, “No, say ‘I want…’,” and now we can say, “No, how do you ask for something?”, and she corrects her question. So, after reading your post, I decided that if she said no to something I knew she wanted, I would ask my husband, and have him answer yes, then give him whatever it was that she wanted. It worked right away, although she was just echoing at first. However, within 2 days of doing this consistently, she is answering yes appropriately about 25% of the time, which is so huge to me, since before reading your blog, she never answered yes! I am so sorry this is sooooo long, but I am just so thankful I found your blog, and I wanted to share our story, and how you have already helped us!! Thank you for what you are doing. It is so incredibly important, and such a blessing! Musings of an Aspie on echolalia. I was well into my own ASD diagnosis and acceptance journey before I realized echolalia was even ‘a thing’ for me. Mine pops up a lot when I’m tired or emotional (or both). This is an excellent bit of work breaking down echolalia from the inside. Enjoy! Enter your comment here…This was absolutely fascinating! I’d never given much thought to any of this before, and you’re right: we all do it. I just never asked myself why until now. I’m intrigued and will definitely be looking at your other posts. Thank you for sharing your experience. This is so helpful to understand my son’s echo-behaviors. If you Google Echolalia/praxia there is so much dry clinical and quite negative feeling “disorder” info out there, not personal explanations of the experience. I wasn’t aware this was echolalia. I find myself doing this all the time. That’s exactly how my son’s echolalia progressed. I think it’s a big step to apply phrases appropriately, especially related to emotions. Great post about the value of echolalia. Any recommendations for books on progressing on to mitigated echolalia? I know this post was from a while ago, but I hope you still check on the messages! I am a speech-language pathologist major in college and am conducting a study on echolalia in children on the spectrum. I believe echolalia is communicative and serves a functional purpose. This belief has only been adopted fairly recently. I was wondering since it is productive and communicative in a non-linear way, how would you recommend an SLP (speech language pathologist) address it in therapy? Should they still try to decrease the use of echolalia, or should they treat echolalia as a appropriate means of communication and expand on echolalia with the child? I would love to hear your thoughts on the most effective way to develop language for young children who have mostly echo and do not produce much spontaneous language many others can understand. Hi Maria, I’m not the blogger, but I want to connect you with a blogger whose child started with echolalia, embraced it with the help of learning about it from autistic bloggers, and her child has developed spontaneous language BECAUSE of that. Diary of a Mom – https://adiaryofamom.com/2014/06/06/color-commentary/ – type echolalia in the search for additional posts. It’s so amazing to read about how her daughter’s language progresses. Thank you for this article on echolalia. My 5.5 yr old repeats phrases and occasionally entire books and movie scenes (including tone of voice) from memory. What really hit me hard was the reference to the books and how after many years he remembers the lines from the children’s books. I cherish these memories as well, and my daughter still remember a lot of the books we read to her as a baby/toddler. one thing that i used to do when i was like eleven was that i’d say something out loud and then i’d repeat very low the last word. i never would’ve realized i did that if my cousin hadn’t told me i did it. i still do it sometimes. it kind of feels like i’m tasting the words, seeing how it fits. is it considered echolalia? i don’t actually repeat other people’s words, not that i know.